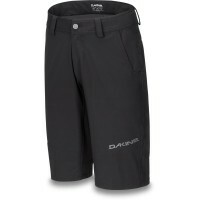 The Dakine Dropout Bike Short is a slightly wider cut mountain bike and freeride trousers without padded insert. The elastic fibers, the bike pants is very mobile, lightweight and comfortable to wear. The fabric is soft, easy to clean and it dries quickly. Despite its loose section sits these sports trousers very well and can be narrowed if necessary on the waistband. A sport-chic sports and leisure pants by Dakine, ideal for the next Bike & Hike Tour! These Dakine cycling pants is cut a little, so that protectors can be worn underneath. Customer evaluation for "Dakine Dropout Bike Short India Ink"